As you may know, Spain had been ruled by Muslim conquerors for many centuries and the last Moorish armies were driven from Spain in 1491. It was claimed that the Spanish armies were led to victory by Santiago, the reincarnation of Saint James the apostle. The Spanish celebrated the defeat of the Moors by creating a dance drama—Los Moros y Cristianos, which they taught to the Indians of the Americas to emphasize the power of the Christian God. This performance was quickly adopted in Guatemala. According to Barbara Bode, in The Dance of the Conquest in Guatemala (1961), the Moros y Cristianos “became the inspiration for plays that adapted the theme of conquest to the New World and to local heroes” (page 211). On the basis of this history, that the Moros y Cristianos came first and the other dances later, 20th century North American mask collectors have assumed that the older masks could only be from the Moros y Cristianos dance. To further simplify, every older mask of an archaic style has simply been called a “Moro.” Here is one of those “Moro” masks. 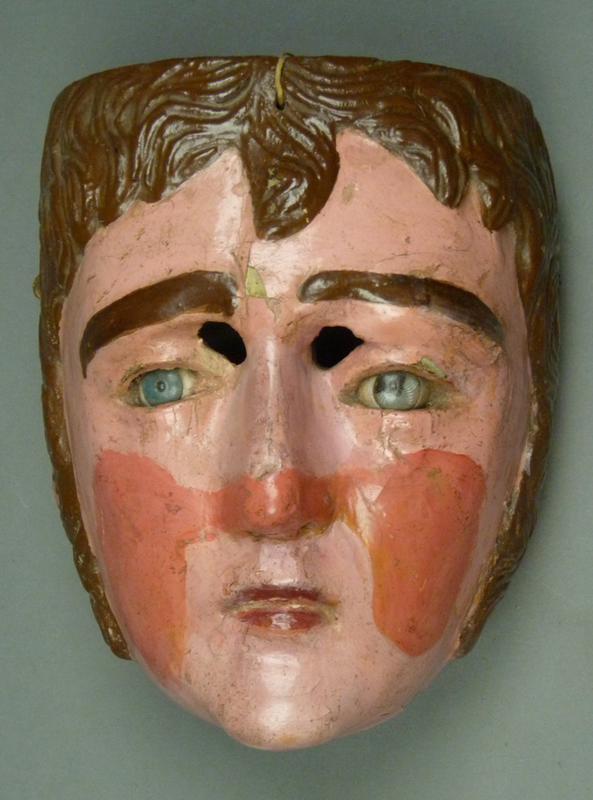 The mask of Don Pedro Portocarrero in last week’s post was a more recent example of this form. I bought this mask from Robin and Barbara Cleaver in 1992; they had obtained it from Spencer Throckmorton. 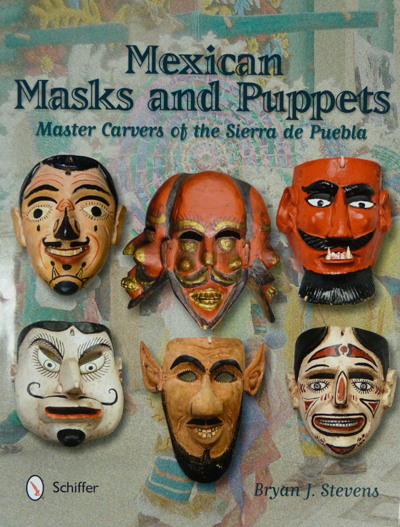 In his 1988 book, Guatemalan Masks: The Pieper Collection, Jim Pieper speculated that such masks, with their extremely dark patinas, might be 150 to 200 years old. While this may be so, definite proof is lacking. As I noted last week re the Pedro Portocarrero mask, this version that lacks a mustache or goatee can represent a male or a female figure. These masks are very beautiful. Similar masks appear in Pieper’s 2006 book, on pages 149 and 184. Last week we looked at a number of masks that could have been worn in either the Toritos or the Conquest dances in Guatamala. Today I will discuss just a few more masks from the Conquest dance that are less likely to have appeared as Vaqueros in the Toritos dance. These fall into two groups—those masks of Conquistadors from areas that have a distinctly different design from the Toritos masks and those masks that represent the Quiché Indians who oppose Alvarado and the Conquistadors in that dance. I will begin with a mask worn by Alvarado’s adjutant, Don Pedro Portocarrero. I got this mask from Spencer Throckmorton in 1996; he reported that it was from Coban. 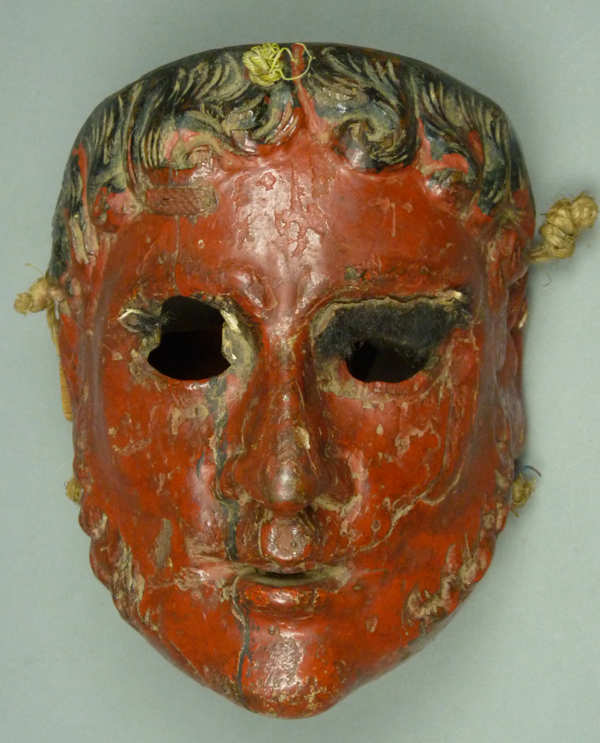 This mask is carved in an older style that one finds on earlier Moor masks. Rather than the stylized sideburns carved in high relief that you saw on the Alvarado mask in last week’s post, these sideburns were carved more artfully in lower relief. There are masks that look something like this one in various Guatemalan dances, and sometimes these are worn by a female figure. The hairline on this mask is masculine, but many similar masks have gender ambiguous hairlines. There are other masks with these features that are obviously male, because they have a mustache and/or a goatee. The second mask in last week’s post was like that. Last week I showed Torito (bull) masks from Guatemala. In this dance, the bull dancers interact with Vaqueros (cowboys). However, many of the masks worn by the Vaqueros are also used in La Danza de la Conquista (the Conquest dance), which portrays the invasion of Indian Guatemala by a conquistador,Pedro Alvarado, along with his Spanish soldiers. As if that is not sufficiently confusing, some of the same masks are sometimes worn for the Moros y Cristianos dance (the Moors and Christians) and similar masks are used in the Venado (deer) dance. Those masks that could represent either Vaqueros or Conquistadors (or deer hunters) will be the subject of today’s post. My discussion of these masks and their various roles will begin with a dramatic mask of Pedro Alvarado, with rosy cheeks. The leader of the Vaqueros, in the Toritos dance, wears virtually the same mask, but with a less menacing expression. In other words, a more neutral mask than this example could easily be used for both dances, while this one would be a stretch as a Vaquero. Because Alvarado is such a heroic (or infamous) figure in the history of Guatemala, the mask worn by this character may seem particularly desirable. Joel E. Brown has noticed that we collectors have a tendency to promote our masks to the highest rank possible, wishing for example to call every yellow haired Spaniard by Alvarado’s name (2008 Volume 1, pages 1-8). Brown has learned that the Alvarado masks are marked by carved features that depict frowning. You encountered this feature in my post about the Patrón and Patrona masks that are used in the Patzcar dance; the white faced masks have swirling brows or hair but those with red or brown faces are marked by carved frowns (July 27, 2015. Also see Brown- Portfolio 2009, pp. 54-57). Well, note the V-shaped carved ridges over the round holes for vision; this mask has those carved frown lines, so this is indeed likely to represent Alvarado. As I noted in the last few posts, Guatemala and the Mexican state of Chiapas have some dances and dance characters in common, probably due to their shared history. More broadly, some of the dances of Guatemala are found in many of the Mexican states. These include the dances of the Moros y Cristianos, the Conquest, and dances with characters dressed as Toritos (bulls). In my post about the Patzcar Dance I included one of the small Torito masks that appear in that performance. 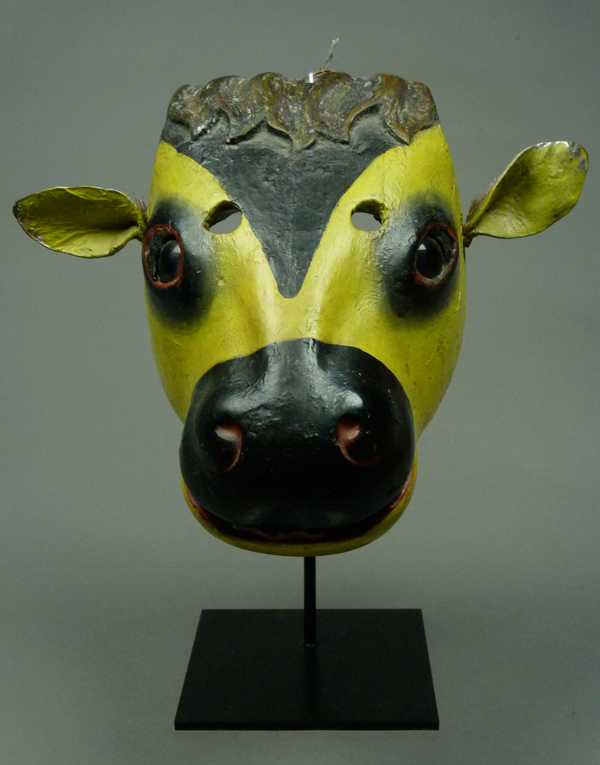 Today I will feature three larger Bull masks from another Guatemalan dance, El Baile de los Toritos. However, because the masks worn by the human figures in that dance can be interchangeable with the masks used in the Conquest dance, I will talk about the human masks from both of those dances in next weeks post. 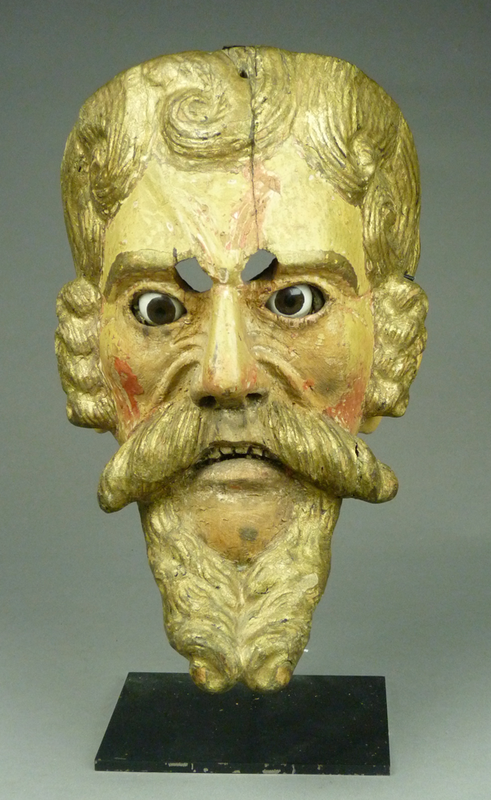 Here is a Torito mask; it is quite handsome with the relief-carved curls above the eyes. I obtained this mask from Spencer Throckmorton in 1995. This week we will examine masks that may have been worn by the Gracejos or Mox dancers in the Patzcar dance. According to Joel E. Brown (2008 Volume 1, page 251) the Quiché word Patzka’r means Gracejos in Spanish and Jokers in English. The dance is named for these characters. Each one carries a whip; in the end they whip one another. 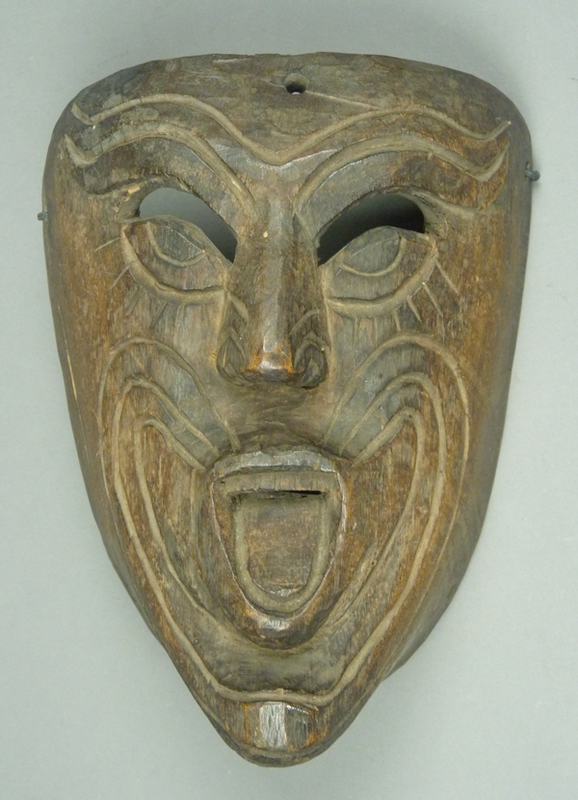 Here is a stained wooden mask like those from the area of Nahuala that does indeed look like a joker. I have no memory or record of this mask’s aquisition and I am simply speculating that it was used in the Patzcar dance. Actually I always think of it as a Jaguar mask at first glance, until I notice the human nose and the absence of fangs. The extended tongue reinforces my suspicion that this is a Gracejo (joker). It is a striking and unusual mask.